Carseat Cinema Review and Giveaway! Mama Say What?! | Mama Say What?! 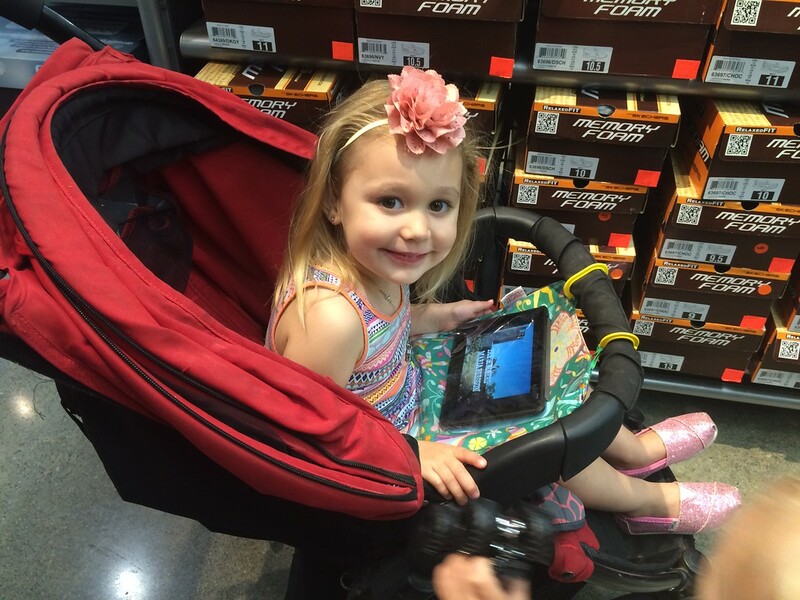 Carseat Cinema Review and Giveaway! The idea is simple, and very smart. It’s a hanging protective cover for your tablet or smart phone, so your child can play or watch a show while keeping the device accessible and safe. It’s made of soft, padded cotton and has a transparent vinyl front. You can use the tablet’s touch screen through the vinyl without a problem. While it is a little bit muted, you can still hear the audio fine. Just turn the volume up on your tablet before it goes into the Carseat Cinema and you’re golden. Bonus: The vinyl can be wiped clean to take off sticky little fingerprints. I have a Kindle Fire that I let my kids use from time to time. 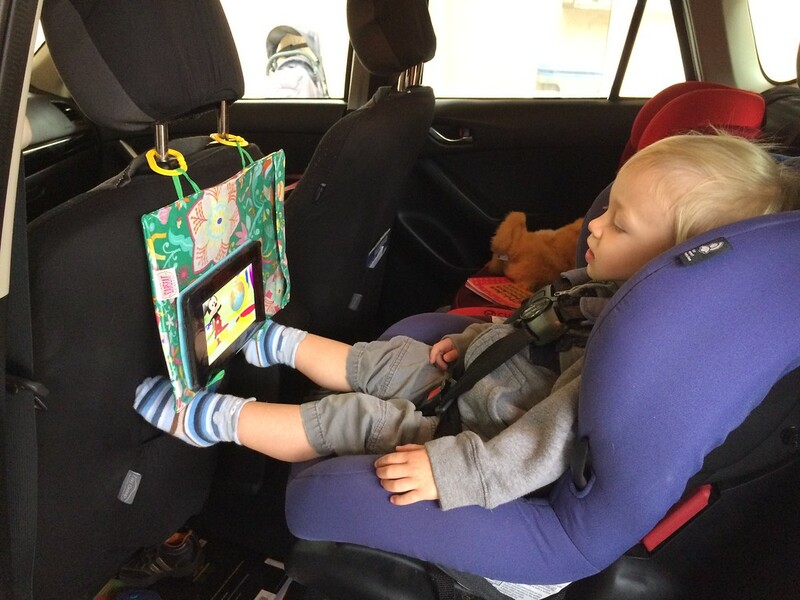 At the time I requested my Carseat Cinema, only large tablet and smartphone sizes were available. Since then, they’ve released a Kindle size— how perfect is that! I personally don’t mind that there is extra space in the Carseat Cinema. Too big is better than too small! I can easily pop my iPhone in there as well. 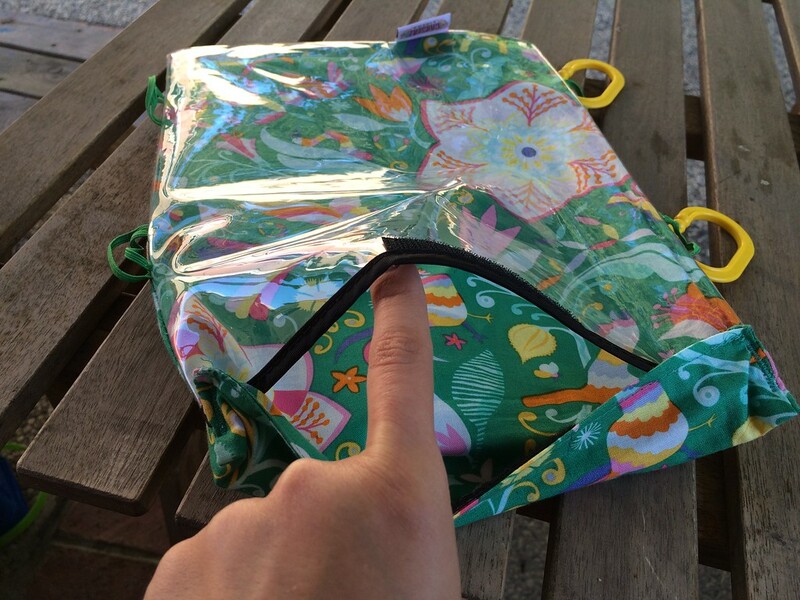 It opens only on one side, and it’s sewn closed on the sides of the flap so it’s unlikely your tablet will fall out. It closes with Velcro in the center of the flap, which means you can even charge your tablet while it’s being used inside the Carseat Cinema, because a charging cable (or even headphones for older kids!) can be pulled through the open part next to the Velcro. It comes in really cute prints. 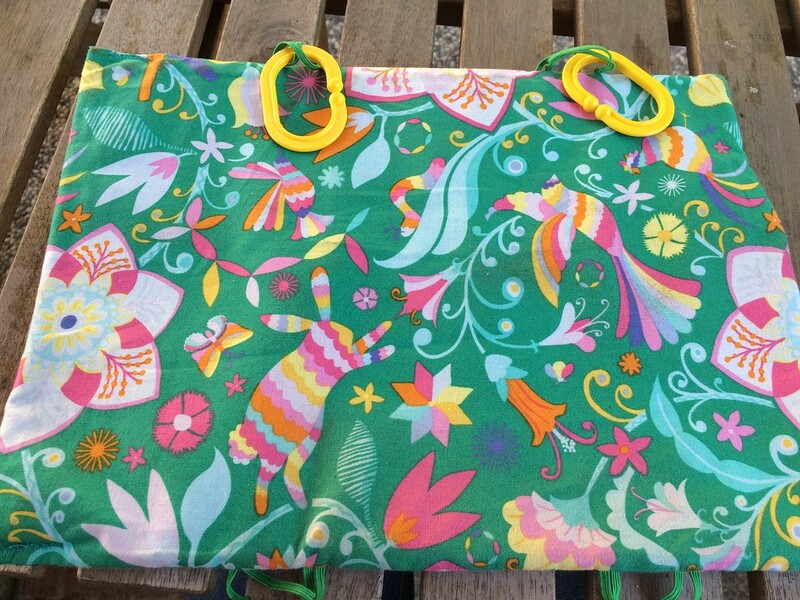 I chose one called “Cinco de Springtime” — it’s colorful and fun. It has little elastic strings on each of the larger sides of the case. 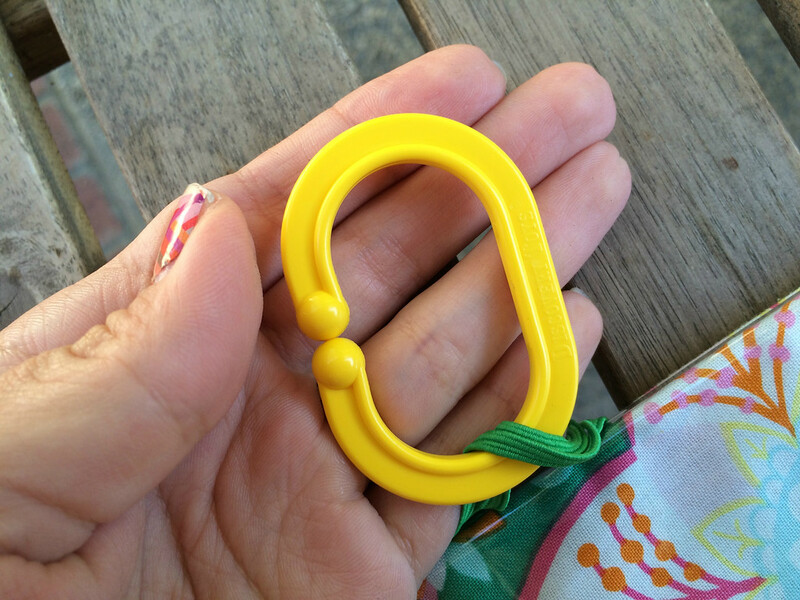 You attach hard plastic rings to two of the elastics. 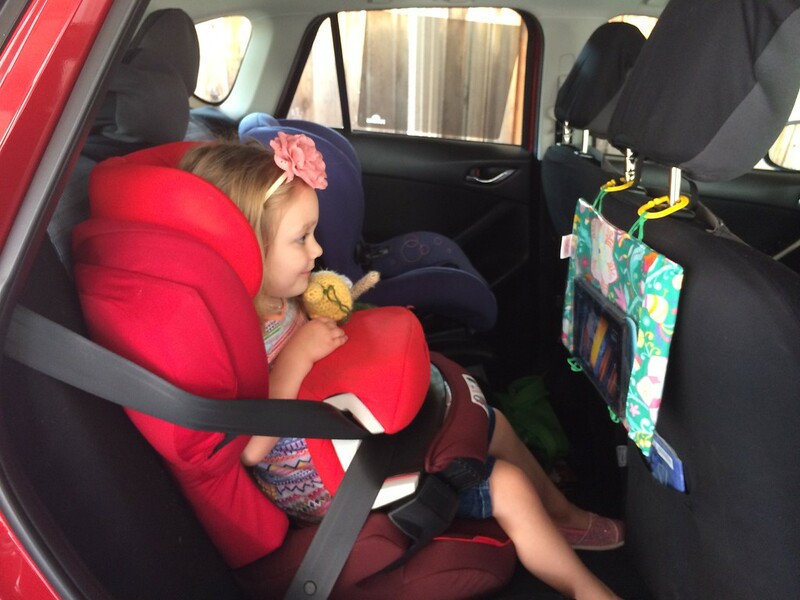 Its purpose is to snap onto a headrest in the car so that your child can watch something while in their car seat. However, it also easily fits onto a shopping cart handle at the grocery store— and this is a huge deal for me, because my son hates the grocery store. I didn’t think the hard plastic pieces would open far enough to fit onto my Britax B-Agile stroller’s wide tummy bar, and so I thought I’d be disappointed. But sure enough, it fits! 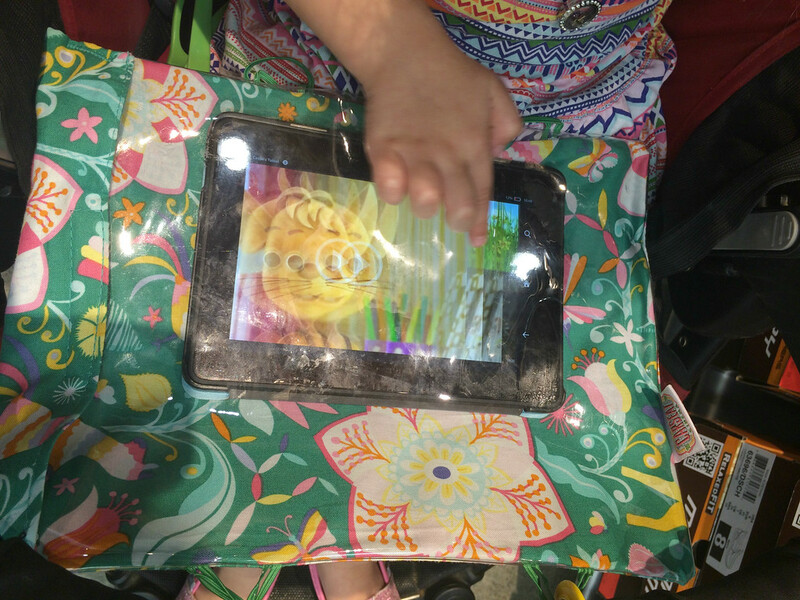 I was able to stroll through the mall and let my kids watch a show without worrying about the tablet being dropped or thrown around, and without worrying about which kid would melt down first. My only con for this product is that I expected it to be water-safe. So when my kids spilled a cup of water near it, I didn’t jump up to remove the tablet. What happened was that, while the vinyl protected the front of the Carseat Cinema, the water seeped through the cotton back and still got my tablet wet. Overall, it’s an excellent product and really great for anyone who lets their kiddo play on a tablet or phone! And the best part? 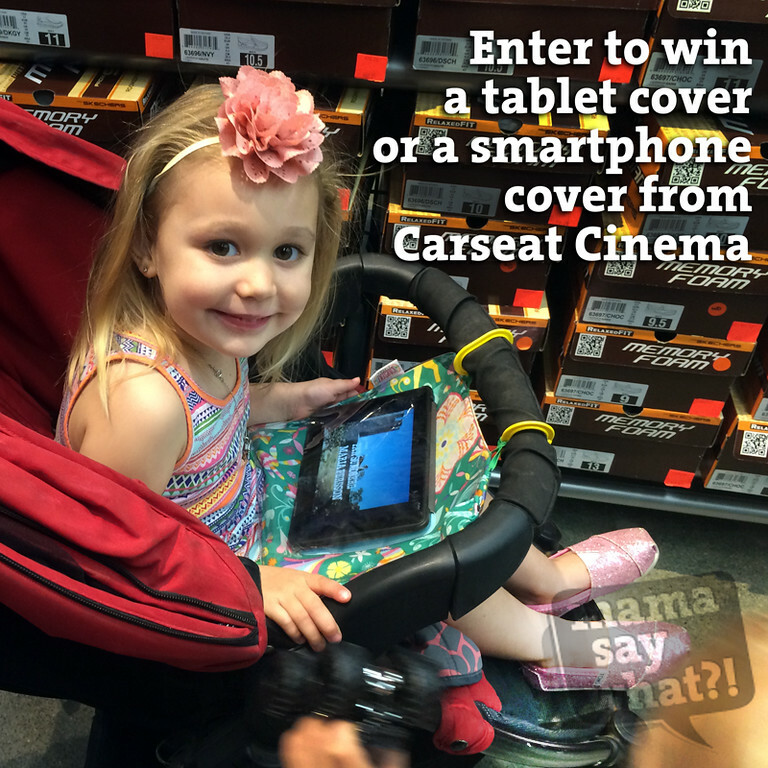 Carseat Cinema is giving away TWO items to two very lucky Mama Say What?! readers! Enter below to win a tablet cover in Green Aladdin or Mod Dot or a smartphone cover in Blue Bollywood. Check out the designs here! Contest begins on Friday, March 27th, 2015 and ends on Thursday, April 2nd, 2015 at 11:59 PST. Must be 18 years of age or older. May reside anywhere world-wide. Must complete the first three entries to win. Winners will be notified by email when the contest is over. Winner must respond within 48 hours or another winner will be chosen. Please check your email or spam box for a message from maryellen@mamasaywhat.com. Comfy Joey Ring Sling Review and Giveaway! Added by Cassie W. on March 27, 2015. 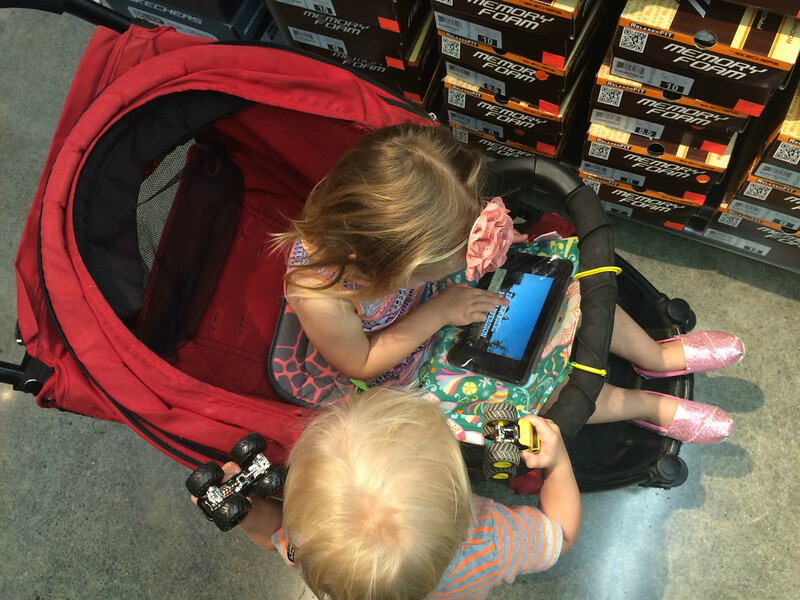 15 Responses to Carseat Cinema Review and Giveaway! I have a galaxy s5 and a galaxy tab 4. These are way to cute! Great pictures!! This really gives me a good picture!! I definitely think I need one of these!! I have an iPad that we use in the car for long road trips or for a long day of running errands. Right now we have a bulky case that we have used creative methods to suspend it from the headrest. This would certainly be an improvement! Thanks for letting us know about this product. We have an iPad and a couple of iPhones. This would be so handy for road trips! Great idea! My sister has one of these and I want one, too! So perfect for long trips! We have iPhones, a regular iPad and an iPad mini! I have a Samsung Galaxy Tablet. I have an iPhone and an iPad! I recently bought one but haven’t tried it out yet. I was hoping that it would work well with headphones or cables connecting to it so I’m glad to hear that they can easily be plugged in even when the flap is closed. I have a Kindle and an iPhone! I’ve got an iPad that my son loves to use.